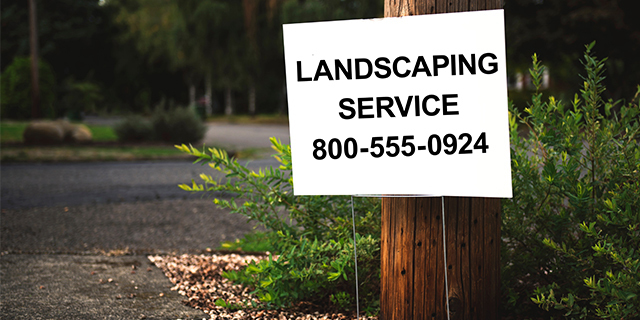 Wondering how to advertise your landscaping business so you can stand out? A multi-faceted marketing strategy is essential. Revenue in the landscaping industry rose to $93 billion in 2018, according to IBIS World, and the annual growth rate averaged 3.5 percent over the five years prior. The number of landscaping businesses in the US also increased by nearly 2 percent – up to more than 513,000 – a figure that does not include individuals who informally offer landscaping services. These statistics suggest that, while owning a landscaping business can be lucrative, it is a highly competitive field. In addition to establishing your brand, you should also identify your primary target audience. What services do you specialize in, and what aspects of the business do you hope to grow? For example, are you seeking more business in residential lawn care, landscape design or commercial grounds maintenance? Which audience demographics are linked to this type of service? Answering these questions can help you determine how to advertise your landscaping business more effectively. By tailoring specific advertising to specific groups, you minimize waste of valuable marketing resources on unlikely prospects. Market before your busy season starts. Beginning at least a month or two before spring, use your chosen marketing channels to remind people to schedule services soon. You can offer “early bird” promotions, suggest new landscaping ideas or simply thank your valued customers. The important thing is to help them keep your business name in mind. Include a portfolio on your website. High-quality photos (e.g., “before and after”) are a wonderful way to showcase your best work. Update pictures regularly, and write descriptions with specific service names. Claim your business’s local listings online. Google My Business, Yelp and Home Advisor are common listing options. Include photos and a link to your website on each listing, and update the information regularly. Encourage happy customers to post reviews in as many places as possible. Take advantage of digital marketing. Post interesting content and special promotions on social media, and engage with your audience often. Explore other marketing channels like email, PPC (pay-per-click), SEO (search engine optimization) and video – potentially with the help of an experienced agency. Consider radio and TV. Radio and televisions ads, though costly, can increase your reach. Instead of a traditional commercial, you could consider sponsoring a relevant public service announcement or starting a weekly Q&A. Contact a local broadcasting network to research options. Don’t forget about direct mail. To increase visibility within your target audience, send eye-catching postcards featuring your logo, a brief summary of services and contact information. Participate in community events and related industry shows. Festivals, home expo shows, your town’s annual chili cook-off – these are all opportunities to connect with new people and promote your services. Join civic organizations. Connect with professionals in related fields to increase business leads and referrals. Always keep business cards with you. Pass them out whenever you mention your business to someone, and post them on public bulletin boards. Never underestimate word-of-mouth advertising. Encourage existing customers to provide business leads and refer friends and family to your business. You may want to offer discounts or other perks as incentives. In the highly competitive landscaping field, figuring out how to advertise your landscaping business can be tricky. Plus, developing a well-respected brand takes considerable time. That’s why so many entrepreneurs choose to invest in a franchise with The Grounds Guys, an award-winning, national landscaping brand. Beyond the obvious advantage of having instant brand-name recognition, The Grounds Guys’ local owners receive comprehensive marketing support and consultation. And, as part of the Neighborly community of home service experts, franchisees receive business referrals from the other Neighborly brands and from the consumer-facing resource GetNeighborly.com. These are just a few of many benefits that The Grounds Guys proudly offers to franchisees. To learn more, visit The Grounds Guys online, or call 888-498-2195 to discuss opportunities with an expert franchise developer near you.